Notts County Ladies boss Rick Passmoor says England defender Sophie Bradley is no closer to returning from injury, despite naming her on the bench against Birmingham City on Sunday. Her inclusion for the goalless draw suggested she was close to returning after a nine-month knee injury layoff. However, Passmoor confirmed Bradley was never likely to feature, but wanted the 24-year-old to remain involved. "For her to sit on the bench, she has to be named as a substitute," he added. "If you have people on there they have to be named as either named as a member of staff, of which you are allowed five and I have fine. So if Sophie wants to sit there she can't," he told BBC Radio Nottingham. 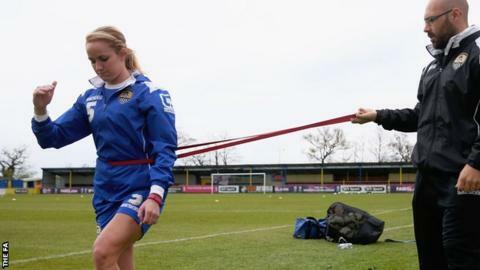 Bradley went through her own pre-match drills with the team's fitness and conditioning coach at Solihull Moors and did not join her team-mates in their warm up. Notts appeared to suffer another injury scare in the game with England defender Alex Greenwood helped off the field with a knee problem. She emerged from the dressing room on crutches, and the full extent of the injury is not yet known.